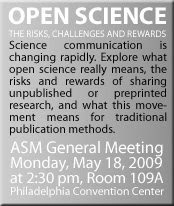 In May I'll be part of a panel discussion on open-access publishing, at the big General Meeting of the American Society for Microbiology. The other participants are 'professional experts': Jon Eisen, Academic Editor in Chief, PLoS; Sam Kaplan, Chair of the ASM Publications Board (ASM publishes about a dozen journals and many books); and Joe Deken of the California Institute for Telecommunications and Information Technology. I guess what I'll bring to the table is the perspective of the ordinary scientist trying to do what's right.